Cudley decides to drop off the TMNT in the tropical rainforest of Brazil, thinking they’ll be of some help. No sooner has Cudley left than the Turtles are met by a cat man that goes by the name of Jagwar. Friendly greetings are exchanged when a jeep filled with mercenaries suddenly arrives and fires at our heroes. The TMNT and their new ally escape into the jungle and the men leave to tell their partners what they’ve seen. 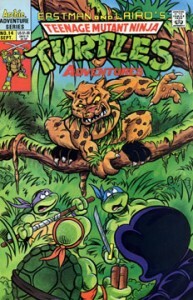 Jagwar leads the TMNT deep into the southwestern jungle to an ancient temple, a place that the cat man calls home. Jagwar then explains the troubles in his homeland, how some people wish to exploit the rainforest and tear it down to make “a quick buck,” like the mercenaries who had fired at them. He also tells the Turtles that these men assassinated a local union leader recently, a man named Chico Mendes, who was a friend to Jagwar. The mercenaries also kidnapped a reporter who had come to do a story on Chico Mendes, and so Jagwar has vowed to free the newsperson. The TMNT quickly assert that they’ll help Jagwar on his mission. The five heroes sit down to eat some fruit and Jagwar tells them the lore of his homeland, how the rainforest was both earth and heaven in one. After his tale is finished, the cat man states that it’s time for them to rescue the reporter… who happens to be April O’Neil! The Turtles are astounded by this information, and the group runs through the jungle to save their friend. Soon enough they find the mercenaries’ camp and quickly defeat the evil men in combat. Once the fight is over, the Turtles and April share a tearful reunion. April notices that Jagwar is also crying, and when she asks him why, the cat man explains that he misses his friend Chico Mendes, and because fifty acres of rainforest is lost every minute. Meanwhile, back in New York City, we see a skyscraper and hear a phone call to Mr. Null reporting about the problems his organization is facing from “mutant animals.” Null orders the mutants to be followed and scrutinized.